City Connect » Culture & Lifestyle » How many people develop dementia in their 30s? If you watched ‘The Truth About Dementia’ last night on BBC1, you’ll have seen an interview with Chris Graham, told at the age of 35 that he was going to develop Alzheimer’s. We blogged about Chris in March last year, when he set off around America on his bike to raise funds for Alzheimer’s Research UK. But his story raises many questions about who develops Alzheimer’s and why. Chris’ brother is in the later stages of the disease at 43 and his father, aunt and cousin all died from Alzheimer’s before the age of 45. This is an example of a family affected by a rare genetic form of the disease, which can devastate generations of the same blood line. In this blog, we’ll explore how common these genetic forms are and what role our genes play in non-genetic forms of Alzheimer’s. Chris and his family are one of over 400 families worldwide that carry a faulty version of a gene called presenilin 1 or PSEN1. Tiny changes or ‘mutations’ in the genetic code that makes up the PSEN1 gene in these families have a huge knock-on effect on how the gene works and on a person’s health, triggering a cascade of events in the brain that causes Alzheimer’s. Family members who inherit the faulty gene will develop Alzheimer’s with 100% certainty and at a young age – often in their thirties, forties or fifties. There are two other genetic mutations that affect families in this way – in genes called PSEN2 and APP (although these are rarer than PSEN1). 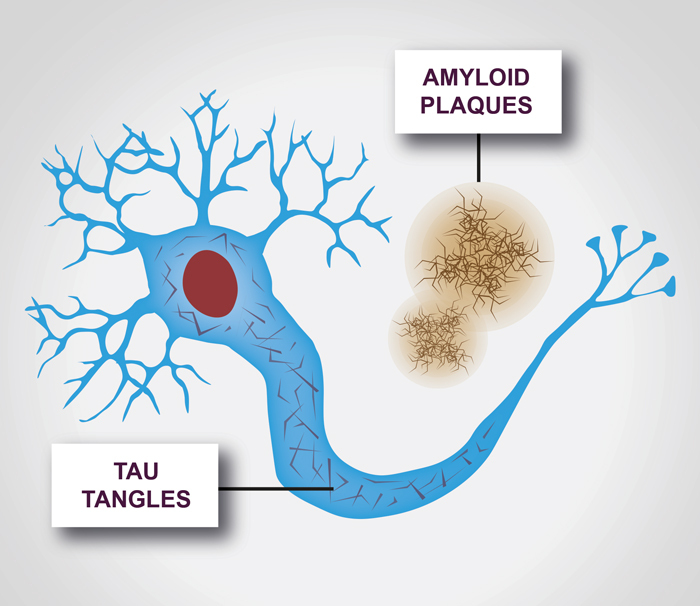 All three of these genes affect the amount of a protein called amyloid in the brain – one of the hallmark proteins linked to Alzheimer’s disease. The rare faulty versions of these genes that run in families like Chris’, cause too much of a sticky form of the amyloid protein to be made, which clumps together to form amyloid plaques between nerve cells in the brain. This event is thought to trigger a molecular chain of events in the brain contributing to the disease. The discoveries of these rare genetic mutations in the late 80s and early 90s have revolutionised our understanding of the biology of Alzheimer’s, although new research is emerging every day that deepens our understanding of these important processes. These inherited or ‘familial’ forms of Alzheimer’s disease are very rare, accounting for less than 1% of all cases of Alzheimer’s disease. But in those families, the disease passes from generation to generation. In these rare cases, it is possible for family members to have a genetic test to find out whether they carry the faulty gene. It was a positive result from a genetic test in 2011 that spurred Chris on to take on his ambitious 16,000 mile cycle ride to raise money for research. Many people are concerned about whether having a relative affected by Alzheimer’s means they’re more likely to develop it too. For the vast majority of cases of Alzheimer’s disease, genetics is only one risk factor for the disease – along with age and lifestyle. It’s a complicated picture and as dementia affects so many people, it is likely that many of us will have a close family member affected. 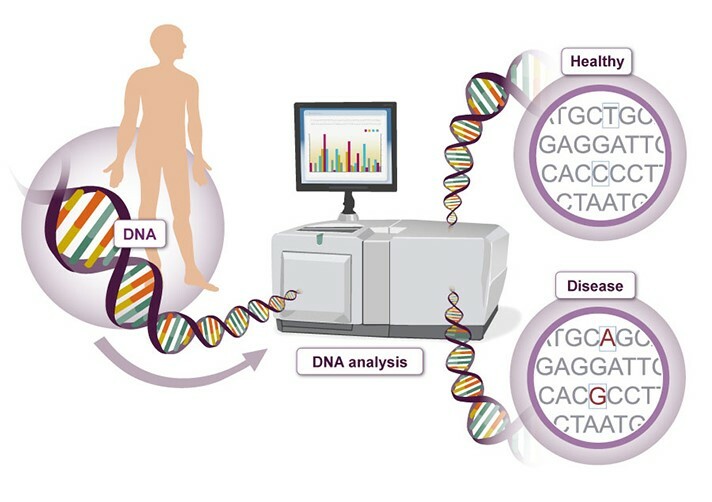 Research funded by Alzheimer’s Research UK has identified over 20 risk genes for Alzheimer’s. Having one or more of these risk genes may increase our likelihood of developing the disease, but unlike in Chris’ case, this still doesn’t mean someone will definitely develop Alzheimer’s – there are many other factors at play. That is why there is no genetic test available on the NHS for these risk genes. Many only have a small effect and people who have a risk gene may still not develop the disease. Similarly, some people will still develop Alzheimer’s despite having no risk genes. 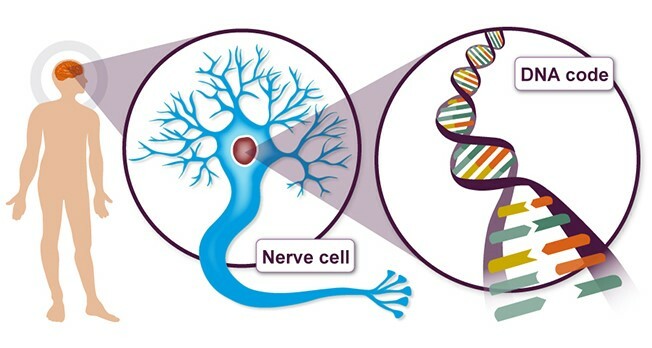 You can read more about risk genes for dementia on our ‘Genes and dementia’ page. While we can’t change our genes and sadly, there is no way to stop getting older, there are some lifestyle factors that could also influence a person’s risk of developing the more common late-onset form of Alzheimer’s. Read more about reducing the risk. One extremely positive thing that Chris is doing in the face of his family’s heartbreaking situation, is volunteering to take part in research. He is participating in a research study run by Prof Nick Fox at University College London. The team there, many of whom are supported by generous donations through Alzheimer’s Research UK, are world experts on inherited forms of dementia and Chris is one of around 140 people across the world taking part in the study of this rare form of the disease. Through his generosity in volunteering, Chris is helping to power progress for everyone affected by Alzheimer’s. Find out more about rarer dementias today by signing up for ‘The Many Faces of Dementia’, a massive open online course.